Sondarya healthnspa - Services﻿ Special of the Month 20% off first hair cut or color. Collagen Rejuvenating skin treatment 3/$210(for skin type 1-3 only). Microdermabrasion $59 with facial add $30 Add Reflexology $25, Scalp massage $25 to your facial. 20% off first hair cut or color. Collagen Rejuvenating skin treatment 3/$210(for skin type 1-3 only). Add Reflexology $25, Scalp massage $25 to your facial. Sondarya day Spa Provides Ayurvedic Skin care, Clinical including Laser hair removal and Microdermabrasion services, Hair Care, Henna Art, Eyebrows Threading, Wedding Services and Products, Gift Corner of unique Accessories Product:Hair:Matrix, Saxy Hair, SkinCare: Ayurvedic products for sensitive skin. Beautiful clean burning custom made Soy or Gel include Theme candles for your home or gifting. 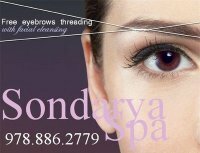 Face Threading Package of 12 ($70 off). *Two Services per client, excludes packages.